Industrial Rubber Hose Manufacturers In India-Ama Husain & Co. Excellent resistance to Paint, Thinner, Solvents and varieties of Chemicals, Core Polyamide, Outer cover Polyurethane. I. D : 6.3 & 10 mm W. P : 215 to 450 Bar. I. D : 12.5 & 38 mm W. P : 14 to 18 Bar. I. D : 12.5 & 25 mm W. P : 170 to 2000 Bar. 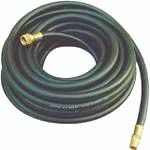 Special oil resistant Synthetic Rubber Hose most suited for Automobile Pressure Cleaning. For Central Lubrication System in machine tools and earth moving equipments. I. D : 3 & 10 mm W. P : 69 to 345 Bar. 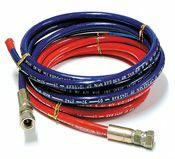 Medium duty hose for general purpose, Industrial and Construction services. I. D : 12.5 & 50 mm W. P : 12 Bar. Special synthetic Rubber Hose for convening Oxygen / Acetylene / LPG. I. D : 8 & 10 mm W. P : 15 Bar. Synthetic Rubber for medium duty service in Engineering Industry, General Purpose Air Line. I. D : 6 mm to 50 mm W. P : 14 to 20 Bar. 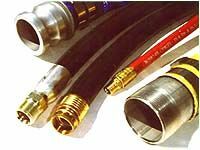 Electrical bonded Natural Rubber Flexible Hose conveys Sand or Abrasive materials engineered for Sand / Shot Blasting purpose. I. D : 20 mm to 50 mm W. P : 7 Kg / Cm2 to 10 Kg / Cm2. Oil / Heat or Electrical resistant synthetic Rubber Hose used as an outer protective covering for Power cable. I. D : 12.5 mm to 75 mm W. P : 10 Kg / Cm2. Designed to handle wide range of Chemicals, Acids Alkalies and Alcoholic materials. I. D : 20 mm to 50 mm W. P : 8 Kg / Cm2 to 10 Kg / Cm2. 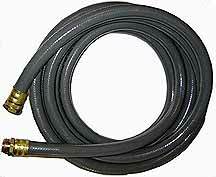 EPDM Rubber Hose recommended for conveying Saturated Steam at a specified pressure. I. D : 12.5 mm to 50 mm W. P : 5 Kg / Cm2.